"Ceos" redirects here. For the management occupation, see Chief executive officer. For the United States Department of Justice agency, see Child Exploitation and Obscenity Section. "Keos" redirects here. For the radio station, see KEOS. It is the island of the Cyclades complex that is closest to Attica (about 8 hour by ferry from Lavrio) and is also 20 km (12 mi) from Cape Sounio as well as 60 km (37 mi) SE of Athens. Its climate is arid, and its terrain is hilly. Kea is 19 km (12 mi) long from north to south and 9 km (6 mi) wide from west to east. The area is 128.9 km2 (49.8 sq mi) with the highest point being 560 m (1,837 ft) above sea level. 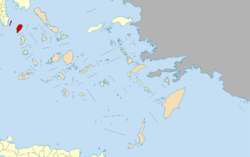 The municipality, which includes the island Makronisos, has an area of 148.926 km2 (57.501 sq mi). Its capital, Ioulis, is inland at a high altitude (like most ancient Cycladic settlements, for fear of pirates) and is considered quite picturesque. Other major villages of Kea are the port of Korissia and the fishing village of Vourkari. After suffering depopulation for many decades, Kea has been recently rediscovered by Athenians as a convenient destination for weekend and yachting trips. The population in 2011 was 2,455. Kea is the location of a Bronze Age settlement at the site now called Ayia Irini, which reached its height in the Late Minoan and Early Mycenaean eras (1600-1400 BCE). During the classical period, Kea (Ceos) was the home of Simonides and of his nephew Bacchylides, both ancient Greek lyric poets, of the Sophist Prodicus, and of the physician Erasistratus. The inhabitants were known for offering sacrifices to the Dog Star, Sirius and to Zeus to bring cooling breezes while awaiting the reappearance of Sirius in summer; if the star rose clear, it would portend good fortune; if it was misty or faint, then it foretold (or emanated) pestilence. Coins retrieved from the island from the 3rd century BC feature dogs or stars with emanating rays, highlighting Sirius' importance. During the Byzantine period, many churches were built and the prosperity of the island rose. It was Byzantine until, in 1204, it was captured by the Venetians in the wake of the Fourth Crusade. The Archbishop of Athens, Michael Choniates, came here in exile after his city fell to the Crusaders in 1205. It was recaptured by the Byzantines under Licario in 1278. In around 1302 during the Byzantine–Venetian War, it again fell to the Venetians, who built a castle on the ancient acropolis of Ioulis. HMHS Britannic, the largest ship sunk in World War I, which was the sister ship to the RMS Titanic and the RMS Olympic, sank off Kea island in 1916, having hit a mine. The earliest indication of it as a Greek bishopric is in a list by the Sicilian monk Neilos Doxapatres of the second half of the 12th century and this may have been a later interpolation, since the list of the Greek bishops of Kea begins only at the end of the 16th century. 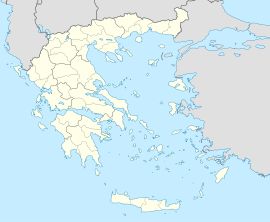 In 1330, as part of the Venetian Duchy of Naxos, it became, under the name Ceo, the see of a Latin Church bishopric of Ceo in the Cyclades, which in 1600 was renamed bishopric of Diocese of Thermia (island Knythos), but suppressed in 1650, after the Ottoman conquest. It is today listed by the Catholic Church as a titular see. The island is a destination for exploring nature and scuba diving, with excellent visibility, rich marine life, and wall, cavern and wreck diving. The water temperature ranges from 20°-26°C. Kea is the scene of much of Mary Renault's novel, The Praise Singer. ^ "The Little Known Greek Island of Kea - The Athenian Secret". Borders Of Adventure. 2015-08-21. Retrieved 2018-10-11. ^ Holberg, JB (2007). Sirius:Brightest Diamond in the Night Sky. Chichester, UK: Praxis Publishing. p. 20. ISBN 0-387-48941-X.